Holiday gifts small business owners can give employees and clients…created by other small business owners! Check out our journals as they are featured on MSNBC Your Business this weekend! Article Reposted from Women on Writing. Original article here. As an avid journaler, I’m always on the lookout for the perfect notebook to pen my prose. I’ve tried everything from plain old composition books to fancy leather bound journals in hopes that the physical paper pages of a book will inspire me to write. (We writers need constant motivation, don’t we?) But I find that if a journal is too pristine and stuffy then I lose the inspiration to write. My perfect journal has to have that unique balance of size, paper feel and weight, and a certain je ne sais quoi. Oh, and the cover . . . the cover must fit my personal style. Sound like a tall order? I thought so, too, until I received what I consider the perfect gift! 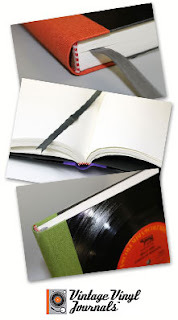 Vintage Vinyl Journals are beautiful, handcrafted notebooks made from recycled materials. Indulge in a bit of nostalgia and flashback to a time when vinyl was king. I can still remember listening to my favorite records with girlfriends—the soft pop and crackle of the needle finding its groove, the light hiss, and the exquisite sound, full of richness and warmth—as we gossiped about the latest and vied for the next turn on the turntable. The front and back covers of these journals are actually made from old albums. Show your uniqueness by picking out your favorite artist or album and truly making it your own. You can search VintageVinylJournals.com by clicking the GENRES tab and pulling up the music you like. For instance, my rockin’ Fleetwood Mac Rumours journal (pictured below), featuring the fabulously witchy Stevie Nicks with popular hits such as “Dreams” and “Go Your Own Way,” is under the genre of Rock/Classic Rock. There’s also a category for Female and Indie/Alternative. And if you’re really going to listen to the music on the cover of your journal while you write in it, fellow scribes will respect the Jazz and Soundtracks genres—there’s a bountiful selection of background music you will need to get the job done. So what can you do with these journals? I’m both an artist and a writer, so I love the freedom and rebellious nature of coloring outside the lines. The pages are blank and ready for your own words or creative aspirations. Each journal contains 220 high-quality pages measuring 7 7/8” x 7 1/2” on 70 lb. acid-free paper. They’re eco-friendly, sustainable, and you can feel great about you’re doing—after all, you just rescued a record from a landfill! That’s not all—there’s plenty more you can do. Use a bit of creativity and check out the suggestions onVintageVinylJournals.com. So now you probably want to jam over to the site and check out all they have to offer (I’ll be joining you! ), but let me tell you about my homegirl, Katie Pietrak—the amazing owner of Vintage Vinyl Journals and her special offer for WOW readers. As a music enthusiast and craft hobbyist, Katie was organizing her own record collection one afternoon—a collection of thousands of albums she started amassing when she was fifteen—when something clicked. Why not take these beautiful albums and make them into notebooks? Since launching in 2011, Vintage Vinyl Journals are sold on their website; in over two dozen retail stores; and at local art, craft, and music festivals. They are a member of the Green Business network and have been certified Silver with Green America. The offices based in Pennsylvania have also been certified green. They have tons of wonderful reviews and have been featured in many newspapers, TV shows, websites, and blogs—including a recent feature on Ty Pennington’s website. Katie is an awesome success story, and she has a special coupon for you! We are excited to announce that Vintage Vinyl Journals was recently featured on Hypable as part of their Holiday Gift Guide! The Holiday season is upon us and before you camp out for Black Friday deals, here are some gift ideas for the music lover on your list. -Decorated Vinyls: Decorating walls with album covers is so overdone. Put a spin on the idea with decorated vinyl records from Etsy. –Vintage Vinyl Journals: Write down your feelings in a vinyl journal and maybe some day your diary entries and poems could come in useful for a song. Who knows, you could be the next Pink. -Vinyl Placemats: Decorating and writing aren’t your thing. Maybe eating is. Keep your table clean with a vinyl placemat during dinner. Reduce, reuse, recycle. You’re even keeping the Earth clean. -Zipper earbuds: Ever have your headphones get tangled together? Say goodbye to wasted time trying to untangle them with earbuds that zip up. -Princess Leia headphone covers: Use them as headphone covers and as part of your next Princess Leia costume. -Sheet Music: Learn a song for an audition or just practice for fun with sheet music from your favorite shows – Smash, Broadway shows, Disney classics and more. -Live Concert Movies: Going to a concert can get expensive. Turn the sound way up on theColdplay, One Direction and Katy Perry concert movies and get a similar experience for less. We are happy to share that we were included in My Music Thing‘s 2012 Holiday Gift Guide! Anxious over the coming fiscal apocalypse? Let your loved ones soothe themselves with music delivered by these handsome noise-isolating earphones. They use passive noise reduction (the good kind), which protects your ears since you can listen at lower volumes. Anyone still using bundled buds should find these better-built, better-looking, and better-sounding. The lachrymose tinkling from your old music box got you down? Stick it to the man and make your own music with this revolutionary kit. Happy days are here again! And you’ll stay cheery, as you will be working within the diatonic scale. For you budding Shoenbergs out there: that means no sharps or flats. Keep the good times going by adding some music box paper refills . Hey, two out of three ain’t bad. The Vintage Vinyl Journals are made from recycled materials and contain 220 pages of 100% acid-free paper. 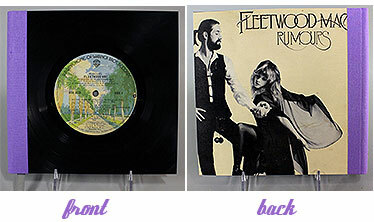 The front-cover features vinyl of your choosing, and the back cover displays the album art. You can select from what’s in stock, or send them your own album and have one custom made at no extra charge. Besides holding photos, keeping concert tickets, or writing the lyrics to your next album, what can you do with these journals? The folks at Vintage Vinyl Journals are glad you asked. And if you’re worried about them destroying precious vinyl for your pleasure, don’t be. We checked and they use mostly damaged and unplayable albums. There may be exceptions for more recent (and readily available) artists such as Taylor Swift and Justin Bieber. So it’s all for the best in the end. Music may not have corporate clout of a Britney Spears fragrance, but it has a perfect name for this gift guide and the cutest bottle we’ve ever seen. What could be geekier than a cymbal-playing monkey? Well, there’s this adult cymbal playing monkey costume , but that can’t provide the everyday enjoyment that the magic monkey will deliver. When someone starts yapping about income tax rates and entitlement reform, just switch on your monkey, take it easy, and let them know you have nothing hide. Vintage Vinyl Journals was pleased to be a part of the Narberth Music and Arts Festival in Narberth, PA (just outside of Philadelphia) on May 6th. The Narberth Music and Arts Festival featured “great food, great drinks, local arts & great music for a great cause” and has been around for many years and draws a pretty big local crowd. This year was the first year they added arts into the mix, usually featuring just music and food. The Narberth Music and Arts Festival does a great thing by having the event free but asks everyone to give $1 towards Philabundance. Philabundance is our region’s largest hunger relief organization. In fiscal 2011, they acquired 21 million pounds of food, distributed 19 million pounds in their service area and exported 2 million pounds of food to assist other area food banks. Narberth has a very small-town feel and you can tell it’s a close-knit community which is often rare to find these days. The event was well organized and the MC was a local newscaster who stressed the donations towards Philabundance. Having live music was something that really drew us into this festival, as well as local dancers performing. The musicians that performed where Vox Prophet, Narband, The Lucky Stiffs and Powerhouse. The response to the journals was fairly good for the amount of traffic that was drawn into the festival and being the Artist’s Alley was a new feature for the event. Having Michael Gray (photo on the right) endorse our journals as left us speechless! 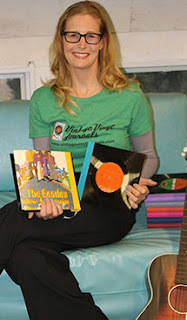 Vintage Vinyl Journals was recently featured on Michael Gray’s Outtakes Blog. Michael Gray is a critic, writer, public speaker & broadcaster recognized as a world authority on the work of Bob Dylan, and as an expert on rock’n’roll history. Gray has published many books, including those about Bob Dylan, Elvis Presley, Frank Zappa, and Blind Willie McTell. I urge you to check them out – link to his Amazon page here. His work has also been published in Rolling Stone, The Times, Literary Review, Independent, Guardian, Observer, Sunday Times, Weekend Telegraph, Independent on Sunday, Sunday Telegraph, Melody Maker, Uncut and more. Check out the review of our journals on his blog post via the link and my response to the question of whether it worried me that I was in effect destroying a lot of terrific old records. Check out the full post here! Thanks Michael Gray for taking time out of his busy schedule, we at Vintage Vinyl Journals appreciate the support! The event was well organized and well attended and was a great way to meet new people and talk to other music lovers. It was a warm spring day and the ambiance was spectacular. The response to VVJ was superb! It got so busy that we even had to recruit some last minute family members who biked to the show. Thankfully they were able to step in and help with sales (Thanks J.D.!). We did not even sit down once it was so busy!